Iznájar is a village and municipal area in the province of Córdoba in Andalucia, southern Spain. It lies on the Genil river approximately 110 km from the provincial capital of Córdoba very close to the borders with both Málaga and Granada provinces at a height of 539 metres above sea level. Iznájar is a classic "pueblo blanco", or white village and is surrounded by its "Aldeas" - sub villages including La Celada, El Higueral, Solerche to name but three. A rural paradise amongst Andalusian olive groves, with a stunning view over the hills and the quiet blue of the dramatically shaped lake, Casa Rural El Olivar offers you a pleasant holiday destination to really rest and relax. Casa Rural El Olivar is a completely renovated farmhouse which has been converted into a comfortable and stylish Bed & Breakfast. The farm has been built in a hillside with several terraces on different levels. A Mediterranean garden surrounds the house with an infinity edge swimming pool located on the lowest terrace, giving the impression that the water is flowing into the lake. Almogía - small town roughly halfway between Malaga and Antequera, in the foothills of the Sierra del Hacho, in the shadow of the Sancti-Petri peak. Probably dating back to Roman times, an attractive hilly area to visit. The hotel is an approximate copy of a 17th century Cortijo (A gentleman's farmhouse) complete with a beautiful MIRADOR (formerly used as a look-out tower) and a large enclosed garden patio. Our primary aim is to create an atmosphere more in keeping with a country home than a hotel. All bedrooms are equipped with Super King size or Twin Beds, have comfortable sitting areas and are fitted with combination air conditioning and heating systems. Álora - small town situated approximately 40 kms north of Málaga and just 12 kms south of the famous El Chorro. Typical white village (Pueblo Blanco) nestled between 3 rocky spurs topped by the ruins of a magnificent castle, built initially by the Phoenicians and then expanded under Roman rule. Virtually destroyed in the 5th century by the Visigoths, and then rebuilt yet again under the Moors. All that remains is the decorative steel door and the traditional Arab Mirador. Top-rated property, showcasing an outdoor pool and views of the mountains, B&B Casa Arroyo De La Montaña is located in Alora. 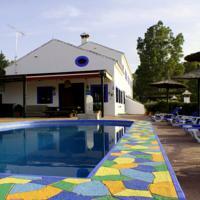 The bed and breakfast has a year-round outdoor pool and sun terrace, and guests can enjoy a drink at the bar. Free private parking is available on site. Some units include a sitting area where you can relax. For your comfort, you will find bathrobes and slippers. There is a shared kitchen at the property. Malaga is 32.2 km from B&B Casa Arroyo De La Montaña, and Marbella is 38.6 km away. 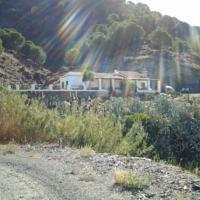 The nearest airport is Malaga Airport, 30.6 km from B&B Casa Arroyo De La Montaña. 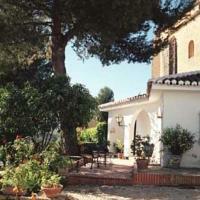 Hidden Valley Andalucia is situated in the countryside surrounded by a 25 acre olive grove. It offers stunning views across Guadalhorce Valley. You can walk to the white washed village of Alora in 20 minutes. 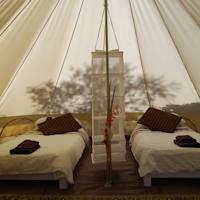 Guests can enjoy their stay in a luxury bell tent, all equipped with full size beds. Bed linen and towels are provided. Each tent has its own private flushing toilet. El Chorro lakes and Caminito del Rey are 10 km away, while Málaga can be reached in a 40-minute drive. A free shuttle service can be arranged from Alora Train Station, while there is a surcharge for the Malaga Airport transfer service. This property also has one of the best-rated locations in Alora! Guests are happier about it compared to other properties in the area. Antequera - on the main rail line to Granada, is an ordinary, modern town, but it does have peripheral attractions in a Baroque church, El Carmen, which houses one of the finest retablos in Andalucía, and a group of three prehistoric dolmen caves . The most impressive and famous of these is the Cueva de Menga, its roof formed by an immense 180-tonne monolith. To reach this, and the nearby Cueva de Viera (same hours), take the Granada road out of town - the turning, rather insignificantly signposted, is after about 1km on the left. A third cave, El Romeral (same hours), is rather different (and later) in its structure, with a domed ceiling of flat stones; it also lies to the left of the Granada road, 2km further on, behind a sugar factory with a chimney. This parador is located on the Paseo Garcia del Olmo, a beautiful landscaped part of Antequera, just a few minutes from the historical town centre. It is 49 kilometres from Malaga and 150 kilometres away from Seville. The bedrooms are medium sized and traditional in decoration keeping the general style of the parador. The restaurant offers traditional dishes from Malaga with local touches, such as "porra antequerana" (cold vegetable soup). This is an ideal place for those seeking rest but also for those looking forward to visit the provincial capitals of Andalusia which are close and easily accessible by car. Benaoján - a small town with a typically Moorish character with cramped, narrow streets converging neatly onto the plaza and church. A growing hillside town famous for its Chorizo sausage. Close to the village are two famous prehistoric caves, Cueva del Gato and Cueva de la Pileta. Molino del Santo is stunning – an 18 bedroomed hotel with heated pool, beautiful gardens, restaurant and bar offering you a place to relax in the countryside near the famous town of Ronda. You can enjoy the great food, delightful atmosphere and attractive terraces even if you’re not lucky enough to be staying in the hotel. We are open seven days a week during our season. The local English-speaking staff will make sure you are welcome immediately and do all they can to help you with anything that will improve your stay: extra pillows, special dietary requirements, information on any aspect of the area. Cartajima - Cartajima stands 845 metres above sea level, next to the crag of the same name. Its privileged situation at the top of the Genal Valley affords the traveller spectacular panoramic views: to the south to the Genal Valley while the peaks of the Serrania de Ronda mountain range lie to the north. 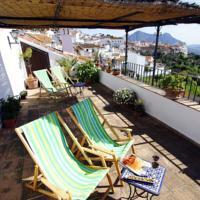 Restful and peaceful mountain village and only a 16 km drive from fascinating Ronda. Also convenient for Sevilla, Cordoba, Granada, Cadiz and Jerez. Los Castaños, the charming little hotel situated in quiet historic Cartajima, is a relaxed, sophisticated hideaway in the middle of a tiny Andalucian pueblo blanco. Enjoy a warm welcome by resident proprietors (Di and Lu), sumptuous Western Mediterranean cuisine, and step back in history as you explore Phoenician, Roman, Moorish, and Christian Spain. A restful place to stay, only 16 km from bustling historic Ronda, and conveniently located for Sevilla, Cordoba, Granada, Cadiz, and Jerez - the romantic cities of Andalucia. Comares is a town and municipality in the province of Málaga, part of the autonomous community of Andalusia in southern Spain. The municipality is situated approximately 28 kilometers from the provincial capital and 24 from Vélez-Málaga. It is located in the foothills of the Montes de Málaga 703 meters above sea level. Comares is one of the 31 villages that make up the comarca of Axarquía. It is bordered to the north with Riogordo, to the north, northeast and east with Cútar, to the south with El Borge, to the southwest and west with Málaga and to the northwest with Colmenar. Located in the Andalusian hills, Casa Andalouse has a shared outdoor pool with amazing valley views. 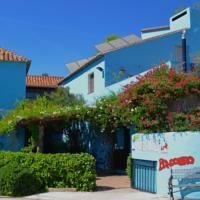 Surrounded by olive and fruit trees, This apartment offers free WiFi and a TV. Casa Andalouse features tiled floors and Moorish-inspired décor. This apartment has 2 bedrooms, 1 bathroom, and a living space with dining table. 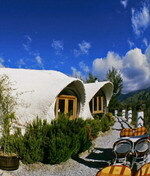 The property can also arrange climbing and hiking trips. You can drive to the beaches of the Costa del Sol in around 45 minutes from the Casa Andalouse. Málaga Airport is an hour’s drive away, and a shuttle service is available on request. Natural scents and sounds caresses the skin, ecstatic views disappear in the horizon, a taste of life. An oasis for enjoying the Mediterranean. Situated in one of the most peaceful and picturesque corners of Axarquia (Costa del Sol) with panoramic views over Frigiliana and Nerja, to the sea and mountains. At 60 km. from Malaga, 10 km. from Nerja, 8 km. from Torrox and 4,5 km. from Frigiliana. Original restaurant in a snail-shaped dining room with a spacious outdoor terrace where you can taste and enjoy Andalusian/Mediterranian cuisine. Bar, pool, gardens and parking. Júzcar - typical small white village (pueblo blanco) in the Serrania de Ronda. Streets and houses have been built to suit the mountainous terrain. Incredible mountain scenery - ideal for birdwatchers, hikers, and mountain climbers. Hotel Bandolero is a small rural hotel and restaurant located at the entrance of a tiny and charming pueblo blanco (white village) surrounded by stunning mountain scenery. The village of Júzcar is one of seven pueblos blancos of the Alto Genal, an area that has only recently come to the notice of tourists, located in the Serrania de Ronda in Málaga province. For this reason it remains unspoiled, traditional and therefore of great interest to the new breed of tourist who is looking for an authentic experience far away from the crowded coasts. Ronda - Mountain city, full of history. Visit the Arab Baths in Ronda. State protected because of historic interest in 1931, these baths were built at the end of the 13th century or start of the 14th century. The old part of Ronda was built, for defensive reasons, on a high rocky plateau, with the river to its North, West and East sides, and was further protected by a series of defensive structures, particular on the most vulnerable southern flank. The walls and arches remain reasonably intact today. Many historical monuments of great interest and churches to be visited. Make sure you stay a minimum of 3 days to avoid disappointment! A unique and laid-back hotel, situated in the oldest paved street of Ronda and surrounded by historical buildings. It is just moments away from the city centre yet faces the mountains. The hotel offers 14 rooms, all with their own character and furnished with all the comforts. Above the intimate bar and dining room, is an outdoor swimming pool and sauna, a recreation room with a pool table, a library as well as a computer with free access to the internet. Several romantic courtyards and terraces offer stunning views and the subtropical garden with exotic plants, birds and fish is an attraction for nature lovers and children. We are a new hotel in the centre of the old town in Ronda, with five large rooms which are very attractive and comfortable. The hotel has a wonderful garden and an arab wall around the gardens and hotel. The price includes breakfast which varies every day. The hotel is very quiet and relaxing, with a large swimming pool and lovely landscapes of mountains and green countryside. Gaucin - small village in the Serrania de Ronda with caves dating back to prehistoric times, and later inhabited by the Phoenicians and Romans, then invaded first by the Visigoths, then by the Moors - and therefore has a lot of history! A quiet traditional village, ideal for birdwatchers and mountain climbers. It is possible to visit Gaucin railway station on the Algeciras to Ronda scenic train ride. Located in the charming village of Gaucín, La Fructuosa offers amazing views over the Genal Valley from its terrace. Its country-style rooms come with free Wi-Fi and a spa bath. The attractive rooms at La Fructuosa feature satellite TV and a minibar. Each one comes with a private bathroom and great views. Featuring a traditional wine press, the hotel’s restaurant serves Mediterranean food. You can enjoy a meal on the terrace overlooking the valley. Gaucín is just 40 minutes’ drive from the beaches of the Costa del Sol. You can drive to Ronda in around 35 minutes. Guaro - Small village in the Guadalhorce valley, between Coín and Tolox and next to the Grande river, one of the main tributaries of the Guadalhorce river with views of the Sierra de las Nieves. With moorish origins, this white village is very attractive - the hills, mainly covered in olives and almonds and some scattered cork trees. El Molino Santisteban is situated on the banks of the Rio Grande which flows through the National Park of Sierra de las Nieves, renowned for its picturesque white villages and incredible landscape.The Moorish villages of Guaro and Tolox can be found 10 minutes from our charming watermill used for graining wheat as long ago as the 19th century; today the mill lies dormant and is used as the residence of your hosts. 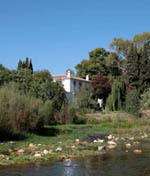 The rural complex of apartments is located in the Sierra de las Nieves Natural Park. The apartments are set around a swimming pool and a children's park. Free WiFi is available in common areas. The area is ideal for a holiday, leaving behind routine, and offering an opportunity to discover the authentic natural beauty of the region and visit cities such as Malaga, Marbella and Ronda. 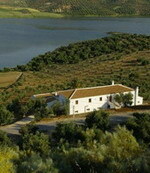 This property also has one of the best-rated locations in Guaro! Guests are happier about it compared to other properties in the area. An old refurbished Andalusian farmhouse with tennis court, swimming pool, sports facilities, comfortable rooms with TV, air conditioning, heating, bathroom. Very quiet, peaceful place for family vacation. Only 1,5 km away from the beach. Unsurpassable climate. 40 km from Malaga, surrounded by typical Spanish villages. Featuring a seasonal outdoor pool, tennis court and terraces with sea views, Cortijo Amaya rustic-style hotel has been adapted from an Andalusian country home and is a 15-minute walk from the beach. 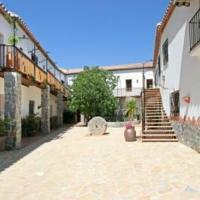 Rooms at the Rural Cortijo Amaya come with air conditioning, TV and a private bathroom. They include free WiFi access. The hotel serves a full breakfast each morning; and drinks are available all day. Dinner is not served. Situated in the small town of Torrox, a 7-minute drive from the coast, Casa Colina del Sol features a garden with citrus fruit trees, swimming pool, and barbecue facilities. The property includes a shared lounge with TV and a dining room where breakfast is served. There is free Wi-Fi throughout and free public parking is available on site. Some rooms feature a private balcony, and all of them are equipped with satellite TV, desk, wardrobe, and kettle. Bathrooms are either private or shared and include a shower. 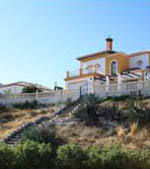 The property is just off the A-7 Motorway and Málaga Airport is a 40-minute drive away. The coastal town of Nerja is 11.3 from the property and Baviera Golf Club can be reached in 15 minutes by car.